Awarding Greatness: appArray's Corporate Philosophy Awards | appArray Inc. The Corporate Philosophy is the foundation of our work culture at appArray. It is broken up into four categories. As pictured above, these are Credo, Spirit, Base, and Virtue. Each category is comprised of three different qualities that we value and hope our employees will possess. That’s what led to the creation of the Corporate Philosophy Awards ceremonies. These ceremonies are one way for the company to support the growth of our members. We hope to nurture and encourage the practice and recognition of these values in order to support each employee’s individual career success. Our goal is to inspire each member to emulate good behavior in their daily lives by identifying co-workers who are setting good examples in each category of the philosophy. 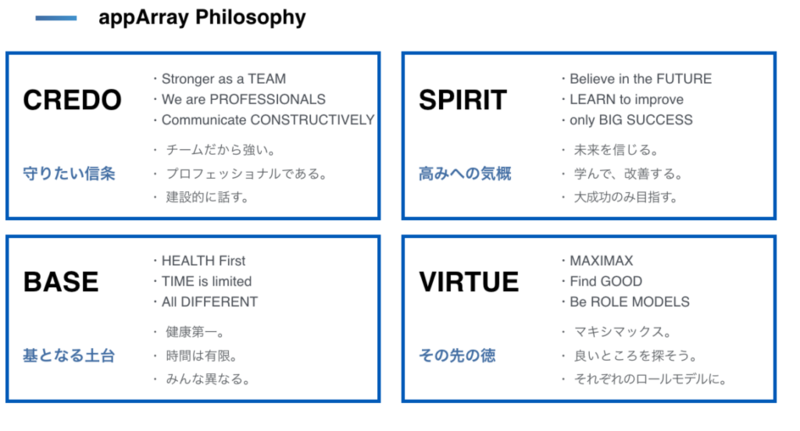 The values in our Corporate Philosophy are important at our company, but, they are also qualities that successful people in many different industries possess. Therefore, we hope all of our employees will strive to embrace and display these qualities. That is why we began the Corporate Philosophy Awards. These award presentations aim to do three things. The first thing these ceremonies do is clarify good practices associated with each quality in our Corporate Philosophy. Doing so allows everyone to identify the behaviors that correspond with each quality. The second function of these ceremonies is to acknowledge and celebrate individuals who possess these qualities. In order to perpetuate these behaviors, it is important for us to reward those who adhere to the Corporate Philosophy and set good examples for others. Finally, these ceremonies aim to inspire junior employees to take the initiative to improve their own behavior. In this way, each individual member, and the company as a whole, can continue to improve. The award presentations will take place twice a week. Each ceremony will use one value in our Corporate Philosophy as its theme, starting from the quality ‘Stronger as a TEAM’ in the Credo category. The award presentations will focus on the defining each quality, explaining its important, and awarding one outstanding member in each category. These presentations will also seek to encourage active participation from various people by including comments from our members about how each winner embodies the specific quality and comments from the winners themselves about why they think each of these values is important. The winners will also be asked to give advice to other members about how everyone in the company can improve in each category. Although these presentations will be short, they will ideally be engaging and uplifting times for our members as well. 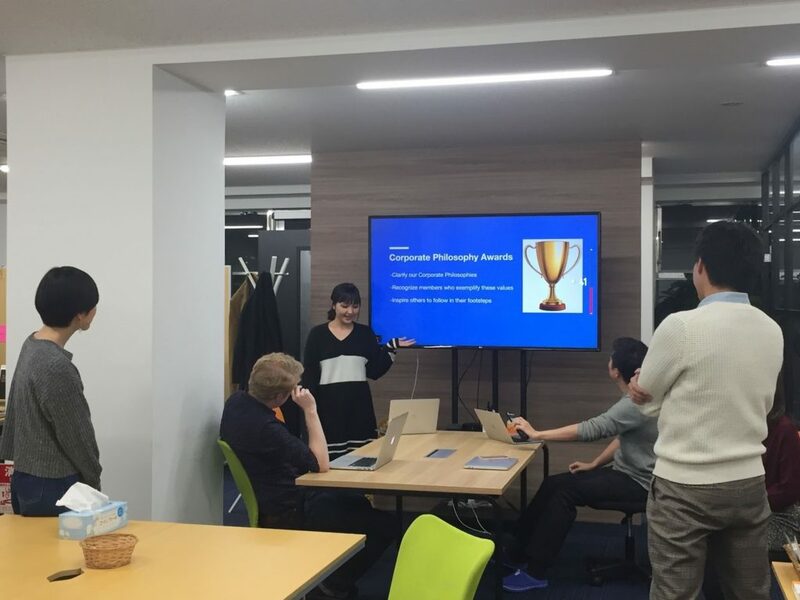 The upcoming articles in our Corporate Philosophy Awards series will explain each quality of the Corporate Philosophy in more detail, talk about why we value each one, and introduce the winners of each award from the Credo, Spirit, and Virtue categories of the philosophy. Interviews with each award winner will also be included in these articles so everyone can get to know our members better. We want to use these articles to shed some light into what we value and who our employees are here at appArray. We hope that everyone will enjoy reading this series. Coming Soon: Say Hello to Protty!